Power-S-501 is a unversal voltage regulator module for powering microcontroller modules, boards and other embedded systems components. It is based on a step-down switching regulator for input voltage of 8V to 40V and provides three selectable output voltages of 5.0V, 3.3V and 2.5V. It can supply a continuous output current of 500mA at an efficiency of up to 96%. 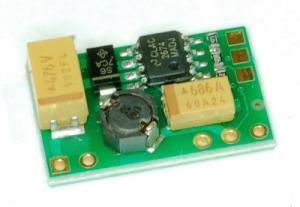 By using a switching regulator over a standard linear regulator like the popular 7805, the thermal power dissipation at higher input voltages and larger output currents is being sigificantly reduced. Calculation example: If an 7805 must supply 250mA at a 12V input, it must convert 7V * 250mA = 1.75W power into thermal energy. Without a heat sink it will head up by nearly 95°C! An efficiency of poor 29%. This is often being underestimated, whereas a switching regulator avoids this problem on principle.